Our system includes galvanized steel earth anchors, which embed in stable soil outside your foundation walls. When the installation is complete, all inward movement is halted, and there is an opportunity for a long-term straightening of your foundation walls. We serve Clarksville, Nashville, Jackson, and many nearby areas in Tennessee and Kentucky. GeoLock™ Channel Anchors are a versatile, effective system that can stabilize walls that are bowing, tipping, pushing in at the bottom, tilting in at the top, or showing similar signs of failure. They are installed with minimal disturbance to your lawn and landscaping, often in a day's time or less. At Frontier Basement Systems, we take great care in leaving each job clean, neat, and free of any damage to your existing landscaping. During our cleanup process, all dirt excavated during Step 1 will be returned to the hole. Workers will thoroughly tamp down the fill in each hole to avoid future soil settlement issues. Finally, the sod will be carefully replaced at each hole location, then raked and tamped to blend seamlessly with surrounding grass. At Frontier Basement Systems we specialize in fixing foundation issues of all types, including problems related to severely bowing, buckling basement walls. Our foundation repair products include written warranties on both the products and our services for you. 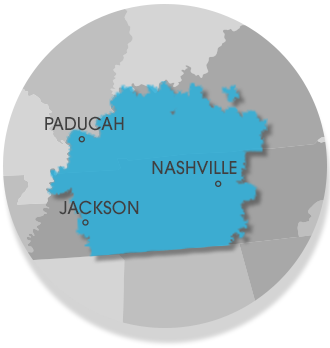 We proudly serve Jackson, Nashville, Clarksville, Bowling Green, Murfreesboro, Owensboro, Utica, Fayetteville, Marion, Philpot, Franklin, Leitchfield, Paducah, Mcminnville, Hartford, Antioch, Shelbyville and many other parts of Tennessee and Kentucky. Helical anchors have been used to stabilize foundations and retaining walls for years -- and they've proven to be quite effective. They are designed like a screw and can be mechanically advanced through the soil with heavy equipment. Wall anchors have been used successfully since the late 1970's to stabilize foundation and retaining walls. These systems consist of heavy-duty galvanized steel earth anchors that are embedded into the soil away from the foundation wall. They are connected to steel plates with galvanized anchoring rods.